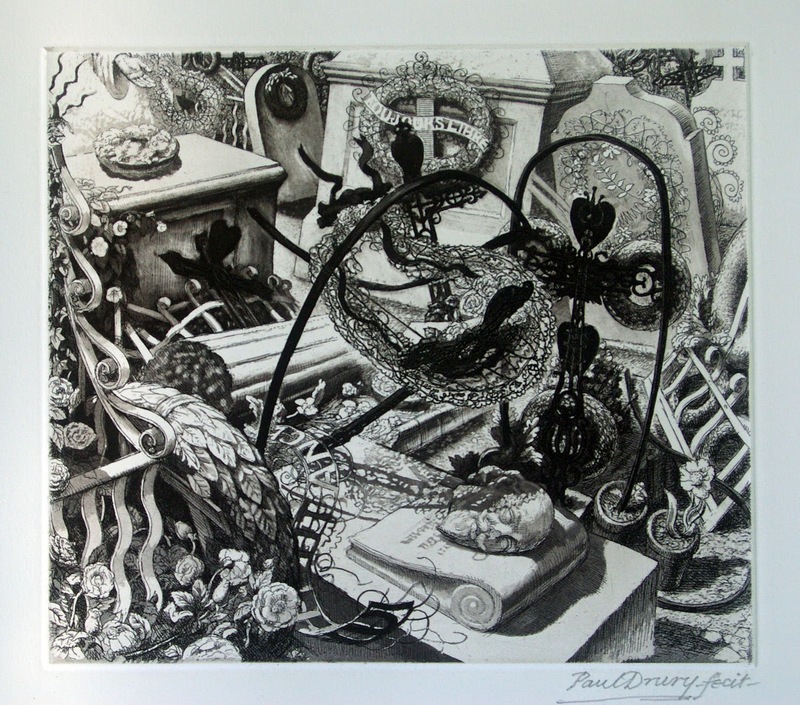 In recent months I have been excited to add four more Paul Drury etchings to the collection. The first, a recent purchase is followed by three exquisite etchings which were a generous gift from an overseas colleague and friend. 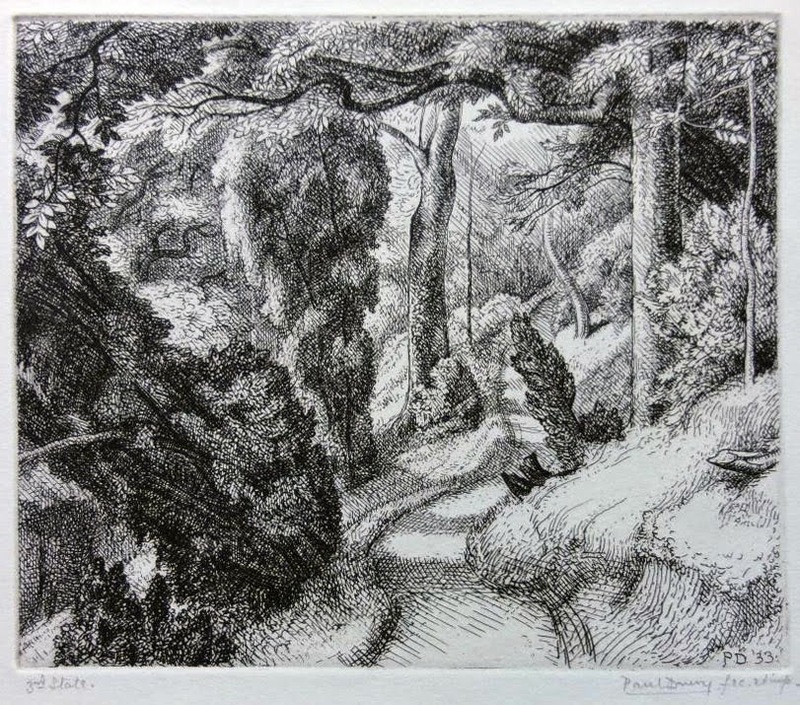 In both of Drury’s etchings of Box Hill, there is a lightness of touch which describes the complexity of the dappled shadows formed from the effect of the strong sunlight bouncing through the trees. The plants seem to bask in the sunlight. The artist uses sinuous etched lines in the shrubs and trees and in foreground section of “On Box Hill” to describe the growth and lushness of the landscape he was experiencing. The two etchings illustrated below titled “Mickleham Yews III” and “Forms in a Wood” were both made in 1950-1 and are part of a series that Drury began in the late 1940’s. The early etchings of the series were made on zinc plates while “Mickleham Yews III” and ”Forms in a Wood” were on copper. 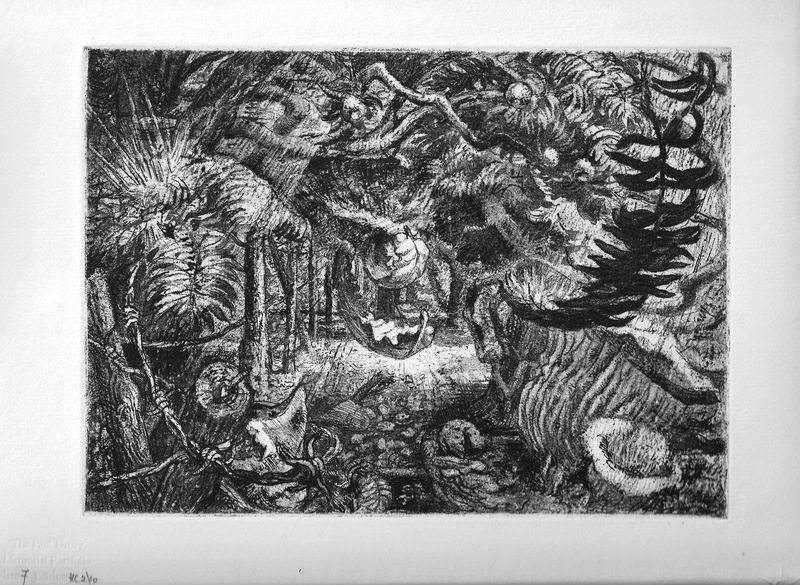 Both etchings are printed in a warm black ink which helps to bring warmth to these mysterious images. These etchings relate well to each other. Both seem to enclose the viewer and tempt them to enter the complex layers of foliage into a central patch of sunlight while also warning them of the possible danger they may experience if they act. 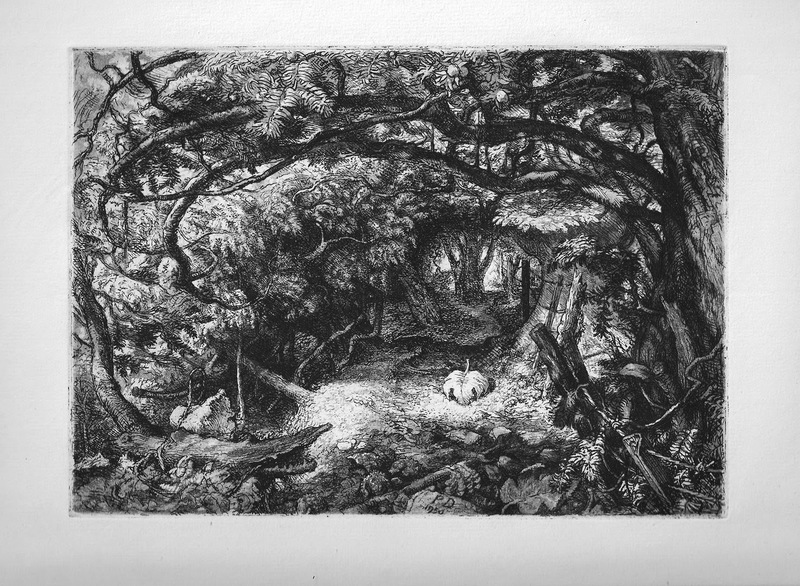 “Forms in a Wood”, a soft ground etching which followed is spatially more ambiguous. Its overlapping forms create a mysterious world inhabited by organic forms twisting through the forest floor and canopy. Instead of the crocodile like form barring the way in “Mickleham Yews III” the traveller entering “Forms in the Wood" must pass through a different obstacle. The last plate I’m included in this post is the beautiful and poignant etching Drury made in 1938 titled “French Cemetery” made many years before the “Mickleham” series. Its complex structure incorporates the use of delicate hard ground line in conjunction with subtle deftly controlled passages of aquatint. This ranges from the lightest of greys to darker areas of intense shadows. To my eye some of the delicate areas of aquatint were achieved through spit biting while other areas with harder edges were shaped through an acid resistant block out.